The Rotenberg vineyard was first planted in the 1940’s by my grand father Emile Zind, mostly with the pinot blanc and auxerrois grape varieties, and my father introduced the Pinot Gris there in the late 70’s. The higher altitude and north-west exposure create a cooler micro climate, ideal or the pinot family, that need long ripening periods to ensure proper physiological ripeness. Another side effect of this red calcareous soil is that the grapes resist longer to the development of rot and keep higher acidities. 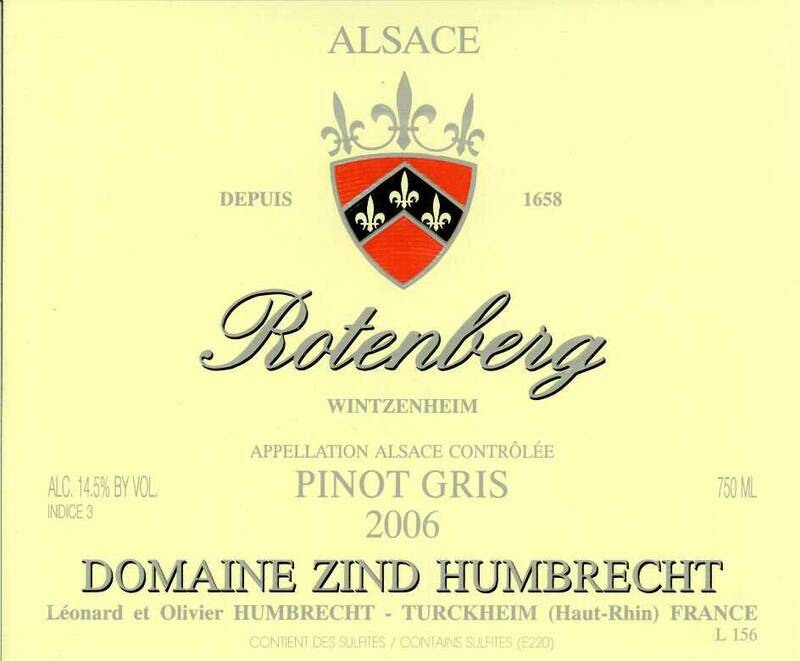 By the time we finished harvesting all the valley floor and went into the Rotenberg for the Pinot Gris, the noble rot had already spread at great speed over many clusters, so yes, this is very close to a late harvest style and it was impossible for the yeasts to transform all the sweetness into alcohol. 1/2008: Rotenberg is often very aromatic with strong apricot/quince flavours. In 2006, the intense botrytis and strong vintage character have brought a lot of stony/earthy aromas. It is much less fruity than usual, but nonetheless very powerful and intense, perhaps more earthy. The palate shows great weight and length, It is obvious that this wine, at this early stage, is not yet showing its full potential. The fact that the palate is more showy than the nose is often a giveaway.